100 Cellos, which gets rave reviews, will finally tour Japan for the first time! 100 Cellos is a creative and innovative project in which 100 cellists from different countries, generations, careers and genres form an ensemble brimming with overwhelming energy, led by Giovanni Sollima and Enrico Melozzi. Under Sollima and Melozzi's leadership, the group takes a wide range of music, including classical, baroque, rock and world music, to the level of artistic heights, led by outside-the-box thinking and following where their artistic desire leads. Since 2012, 100 Cellos toured around Europe, each time recruiting cellists of wide-ranging backgrounds and presenting free musical culture that transcends boundaries of career and generation. 100 Cellos is an epic project that brings together 100 cellists from diverse nationalities, generations and careers to play music and express freedom of expression to connect the world. 100 Cellos is a creative and innovative project where 100 cellists from across countries, generations, careers and genres come together to form an ensemble exuding the level of energy possible only in their performance, led by world-renowned genius cellist Giovanni Sollima, and Enrico Melozzi. The 100 musicians do not play predetermined scores or assigned parts as musicians in an orchestra typically do. Instead, under Sollima and Melozzi's leadership, they take music to artistic heights by spending a long time together, modifying scores and parts, and giving their input as they are led by free thinking and creative desire. The project has performed a number of times in various locations of Europe, sending the message of music culture that transcends over boundaries. In August 2019, 100 Cellos will tour Japan for the first time for a performance at Sumida Triphony Hall in Tokyo's Sumida Ward, a cultural center of Tokyo and ancient Japanese capital of Edo. 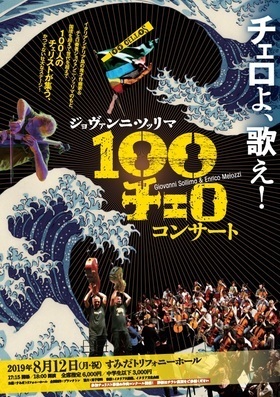 The one hundred cellists will give artistic expression overflowing with creativity that connects Tokyo with the rest of the world ahead of the 2020 Tokyo Olympics, led by Sollima and Melozzi's unusual talent.